A lot of people talk about developing documentation for different learning styles. If you have unlimited resources then you can spend a bunch of time and money developing content in different formats to match different learning styles. But that isn’t reality for most businesses. Most businesses need to get something prepared that can help the majority of their users. If you are starting to think about creating material for different learning styles, stop right now. 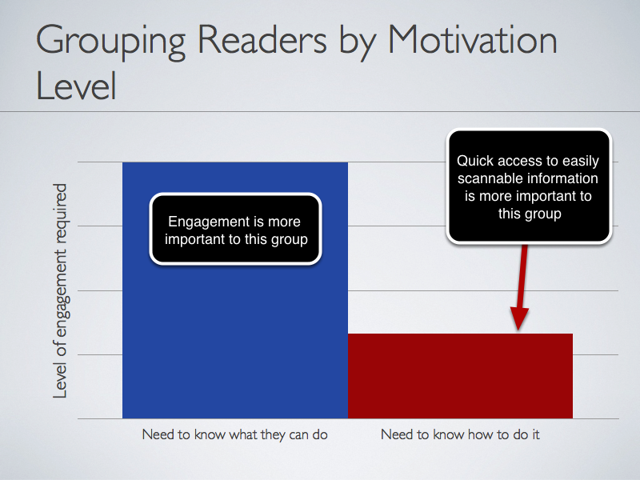 Instead of grouping your audience into different learning styles, start grouping them by their level of motivation. Let’s take a simple example such as defusing a bomb. When someone has to defuse a bomb they are highly motivated to learn the material. You could give them the most awful documentation in the world and they are going to do their best to understand it because the price of failure is high. The person at this stage doesn&apos;t care how engaging your documentation is. They just care about how easy it is to understand. They want to take the quickest path to getting their work done. If your documentation represents the quickest path then they will use it. If it doesn&apos;t then they will get help through other channels. Now look at a potential customer coming to your website. Or maybe the audience is a group of co-workers whom you are trying to convince to use a new application. Their motivation is very low. They aren’t really sure if they care about what you are presenting or not. They need to be presented with more engaging content. This content should catch their attention and help them know why they should use your product or service. The first group, those who know what they want to do, have a specific destination in mind. They just need a step-by-step guide that shows them how to get there. The second group, those who don’t know where they want to go, need to know what options are available to them. They need a travel brochure that shows them the destinations they could go and gives them advice on which destinations would be best for them. If you are creating “Travel Brochure” documentation, then you need to make it more engaging. I would highly recommend the use of video in these instances. You are trying to engage a reader who has a relatively low level of motivation and help them understand why they would want to use your software. Once they know why they want to use your software they then need to know how to use it. Their motivation level has completely changed. In this case, video is not the best format. Visuals are still very important, but video is a linear format which many users will find too time consuming to absorb. The best option is a series of step-by-step images that include many, many screenshots and diagrams. This communicates more information in less time by combining the visual information of a video with the scannable aspects of a text document. When you mix the two together your content becomes harder to author, update and understand.